Of course, any play celebrating Valentine’s Day must include songs like “Love is in the Air,” but how often do you see a grown man dressed up as cupid? Only at No Square Theatre, I suspect. not every romance is pretty. Some are pretty funny.” The brilliant cast proved that to be true. My Ridiculous Valentine was created and directed by Bree Burgess Rosen and Roxanna Ward (who had a delightful repartee with the audience while at the piano), and included a deliciously talented cast – Eric Anderson, Rebecca Butkivich, Claire Day (McClug), Kelly Goldstein, Gary Greene, Rob Harryman, Pat Kollenda, Joe Lauderdale, Marc Marger, Kristen Matson, Steven McIntosh, and Ella Wyatt – who gave the audience both the traditional and the flip side of love. 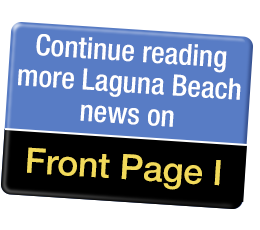 Gail Landau, founder of Catmosphere Laguna, said of the performance, “Bree Rosen and her troupe are so talented and such a delight to watch, as well as hear. The show is as much visual as it is musical”. My Ridiculous Valentine was a ruckus – irreverently unromantic – and ridiculously entertaining. No Square Theatre is located at 384 Legion, (949) 715-0333. The next production is Lagunatots, which will run from March 15-24. For more information, visit www.nosquare.org.